How is your confidence level when applying modifiers? An audit letter might make you second-guess yourself. 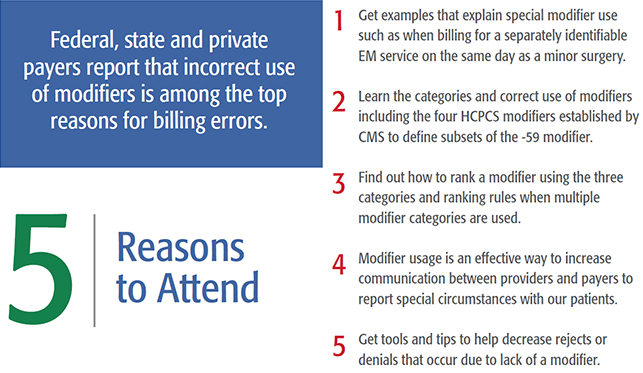 Don�t lose revenue because of modifier misuse, non-use or just to bypass CCI edits! This class will explain modifiers and when it is appropriate to use a modifier to obtain proper payment. Coders, billers, practice managers, charge entry and insurance specialist dealing with appeals should attend. At least one year of coding/billing experience for outpatient services is recommended. Current year CPT and HCPCS manuals are required for this class.